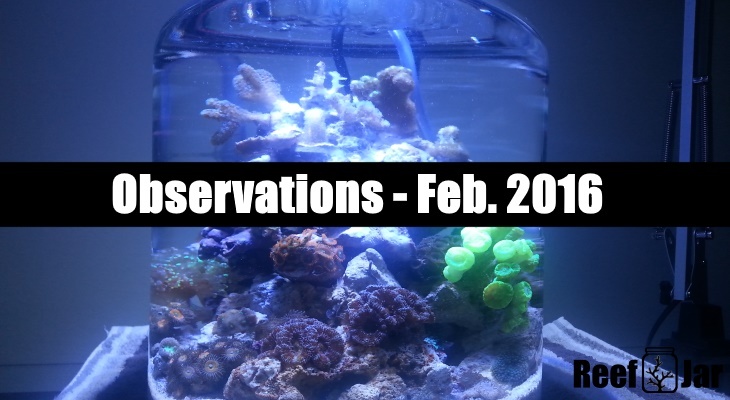 Here are some observational updates for February. Sometimes I see it during the day time, but not too often. 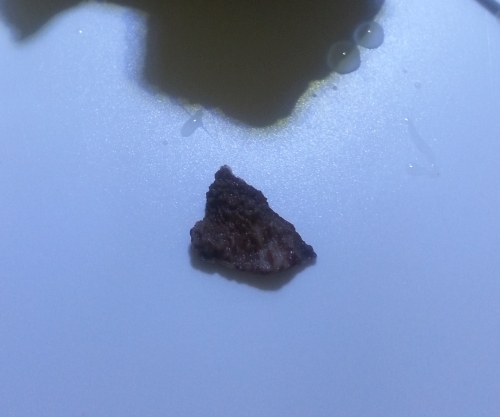 It hitch hiked its way in some how, probably on the live rock that I got near the beginning. I believe there is a much smaller one as well. This one is pretty big and does a good job! 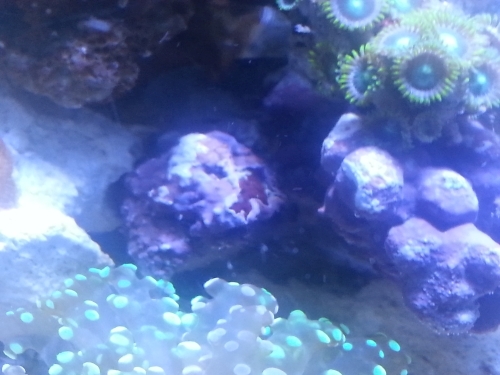 I saw this guy start eating all of the H202'd algae that was hanging around to the right of this picture. Perfect! Anyway, today I noticed it was crawling on the under side of a Red Monti Cap (in the picture above). I thought, oh good it's cleaning algae off the bottom of it. Then I noticed it started convulsing and spewing a white cloud in to the water. I thought "omg is this thing a parrot fish destroying stony coral?" This past week I have been heavily feeding and dosing C-Balance. I'm not sure if these events are related to the candy cane, but I noticed the candy canes are taking on a much more neon green colour with more pop! It started with 1 and more are slowly starting to change. It appears the ones with lower light levels are still not as vibrant. And these things keep splitting with more heads. Crazy! 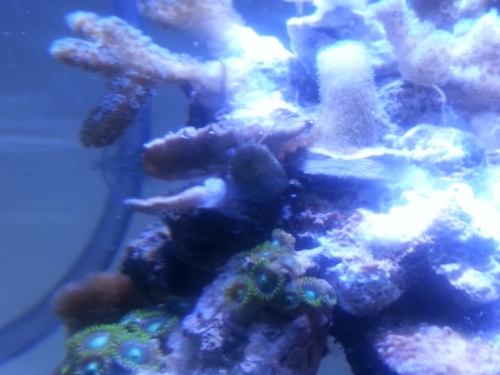 I've been hoping that coralline would start to take off by now, but perhaps the amount of corals I have that use up calcium plays a part in it, another reason why I'm dosing now. I started to look more closely at the pieces I do have that are covered. Some have been speckled with H202 and some buried under other rock work. I noticed this interesting bit... It's much more pronounced in person. I doubled checked to see if it was Cyano', but it's rock solid 🙂 Nice to see some variation of colour. Hopefully it continues to spread throughout the jar. 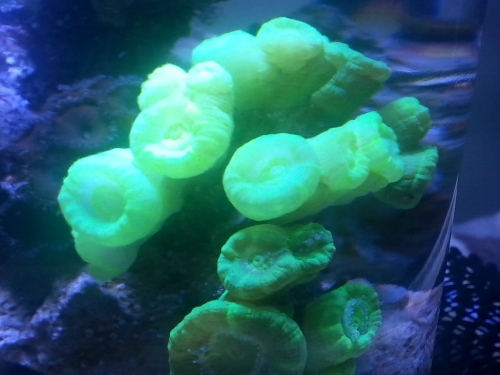 Well the monti caps I have were so/so when I got them and didn't really seem to improve. In fact they started to lose colour possibly due to too much light, so I shaded them slightly. However, since feeding heavily I've noticed the colour coming back. Unfortunately I broke the red cap in to 2 pieces yesterday while adding a suction cup to the heater. No worries though, I glued the broken piece a bit futher down in the jar. The piece that broke off was a piece that wasn't doing so well anyway. It'll be interesting to see if it can bounce back with my new maintenance schedule.